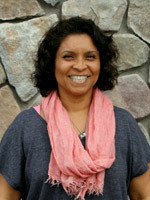 Dr. Phyllis McKinley-Viviani is a passionate scholar-practitioner in the field of clinical psychology who devotes her time to clinical work with the “littles” (0-6 yrs. old) and older. She is a practitioner among the multidisciplinary teams in the Early Childhood Development Clinic and Autism Diagnostic Clinic. In her clinical practice, she delivers parent-child relational therapy, cognitive behavioral therapy (CBT) and other evidence –based treatments to adult, adolescent, and child clients with a wide range of emotional, behavioral and adjustment problems. Her hope is to support children and their families to well-being in their relationships. Dr. McKinley-Viviani received her Psy.D. degree in clinical psychology from Alliant International University/California School of Professional Psychology in San Francisco. She completed her clinical psychology internship at UCSF/SFGH Infant Parent Program specializing in intensive training in Multicultural Infant/Family Mental Health.